I know what I need to do. It isn’t that I don’t know what to do. I just don’t do it. I don’t control my temper, wake up early (when I know God has called me to do so), use my time wisely. I keep doing what I do not want to do. I struggle and it kills me. I hate what I am doing. I HATE it. I hate the sin that lives in me. This morning I hit snooze for an hour, excusing my behavior by citing the time I got in bed last night. I let harsh words roll off my tongue, words that were not necessary. I excused them by pointing out someone else’s behavior. I don’t fall from my ancestors Adam and Eve do I? I keep stumbling, my steps falter. I begin with the desire to please God and I make a mess of it. I seriously set my alarm every morning for an hour I would prefer to sleep through and I pray I will get up. And I rarely do it…I make plans to take deep breaths and respond instead of reacting. I know how to cool myself off before I allow words that cut fly from my mouth. Still almost daily there is someone I wound with words. So how do I walk by faith when all I seem to do is stumble? Who will save me from this body of sin and death? Jesus. He saved me and He sent the Holy Spirit to live in me. He makes it possible for me to walk by the Spirit. To live a life that pleases God. So this stumbling sinful woman will get back up strengthened by the Spirit and take another step and another. And whether I falter or I finally walk a few steps firm in the faith, God is there. He forgives, He encourages, He corrects, He guides, He loves. 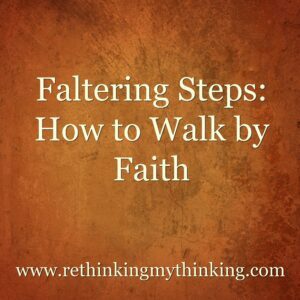 How do you walk by faith even when faltering?